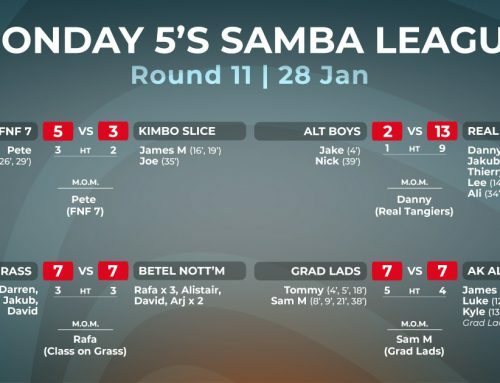 After a heavy defeat last week for Class on Grass at the hands of Grad Lads, they looked for a win tonight against a Kimbo Slice side that haven’t played since early December. 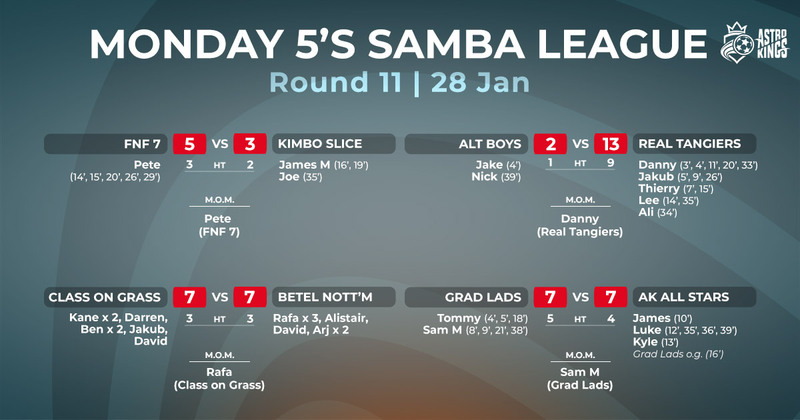 Any hopes of Kimbo getting rusty over the Christmas break were dashed when James opened the scoring for them at the four minute mark, the first of his two on the night. The game was equally match though, and once Class were settled in the game, they ended the half three-two up. 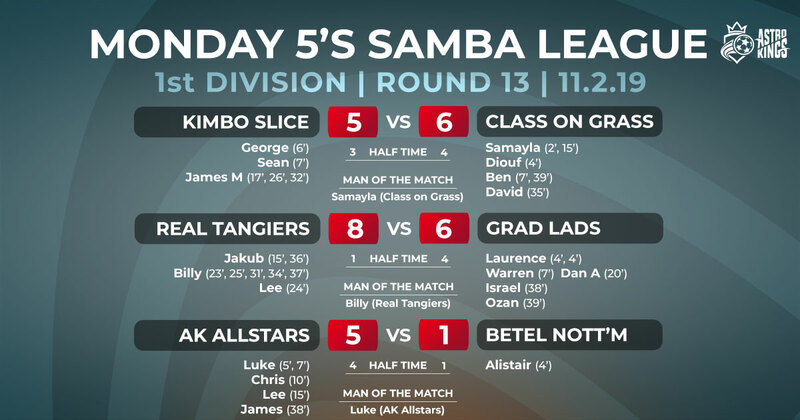 Despite having the minimum of five players, Kimbo dug deep in the second half and put themselves in the lead. 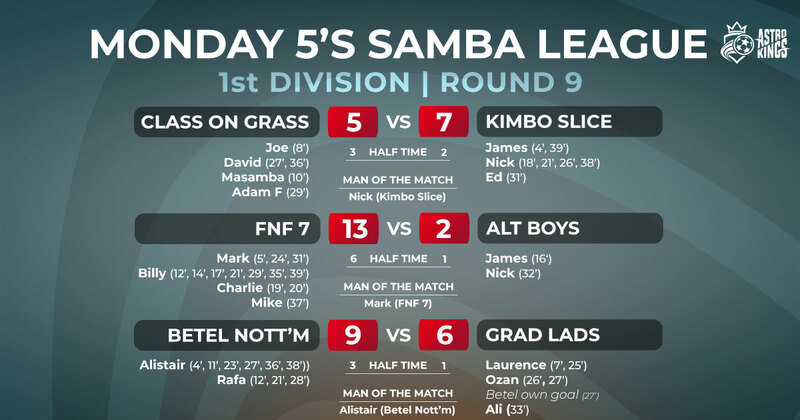 Then with just two minutes remaining, with the scores tied at five a piece, Nick scored his fourth for Kimbo. A minute later James put the nail in the coffin and secured a seven-five win. It was a case of top versus bottom tonight when FNF 7 faced an ALT Boys side who are yet to register a point this season. 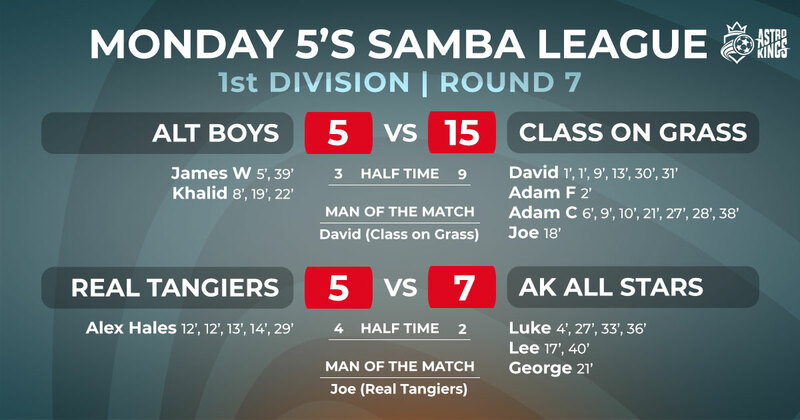 It took five minutes for FNF to open the scoring, when man of the match Mark slotted home the first of his three goals. 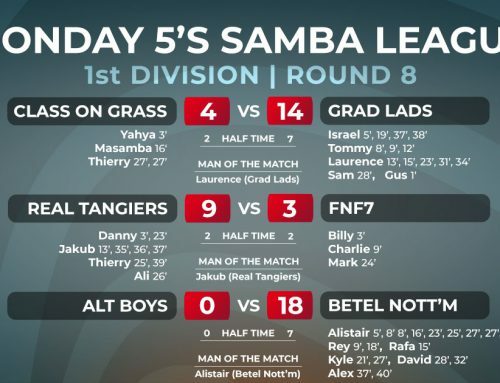 Golden Boot chaser, Billy, soon joined his teammate on the goalscorers list with two of his own, before Boys pulled themselves back into the game with a goal. The afternoon shooting training obviously paying dividends for the Boys. However the Boys were certainly not back in town, FNF went into overdrive and entered the break six-one up, with help from a Charlie brace. Any chance of a second half comeback was soon out of reach when Billy and Mark extended their lead to 10-1 with nine minutes to go. Nick managed to nick one back for the Boys soon after, but when Billy grabbed his seventh goal of the evening with a minute to go, the game was very much over. 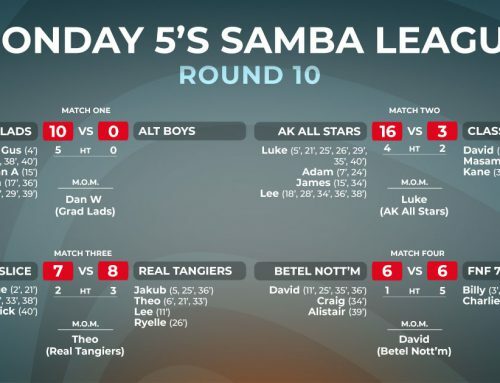 With not much separating the two teams, Betel Nott’m and Grad Lads were coming off the back of 18:0 and 14:4 wins respectively, and tonight’s result would have been a hard one to predict. 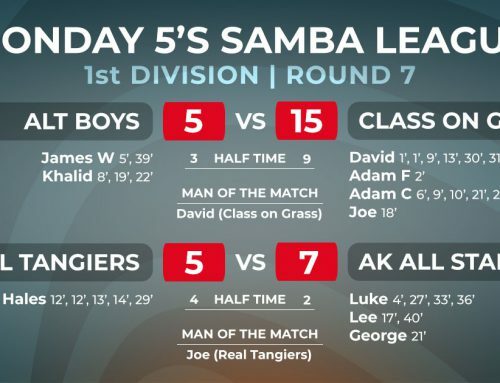 With four minutes on the clock golden boot contender, Alistair McLeish, banged home his first of five on the night for Betel. 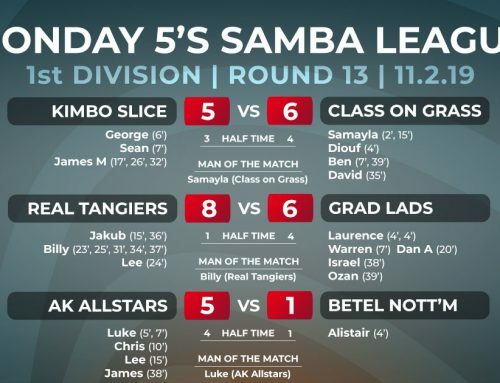 Soon after though, keeping his own golden boot chase alive, Laurence equalised for the Lads, but couldn’t stop Betel head into the break three-one up. 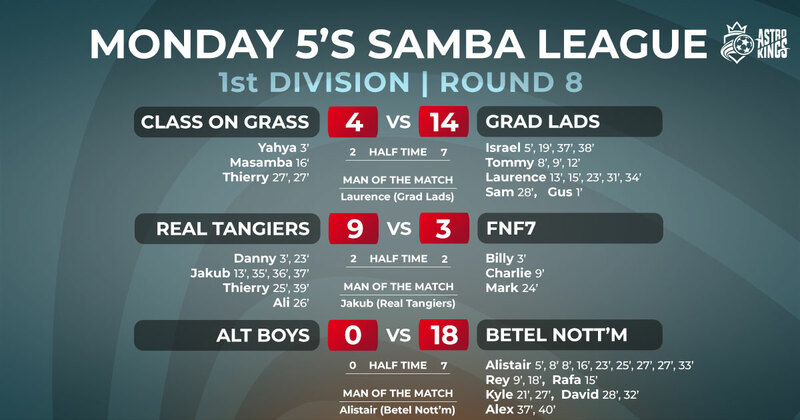 The second half was a closely fought affair, with goals flying in at both ends. 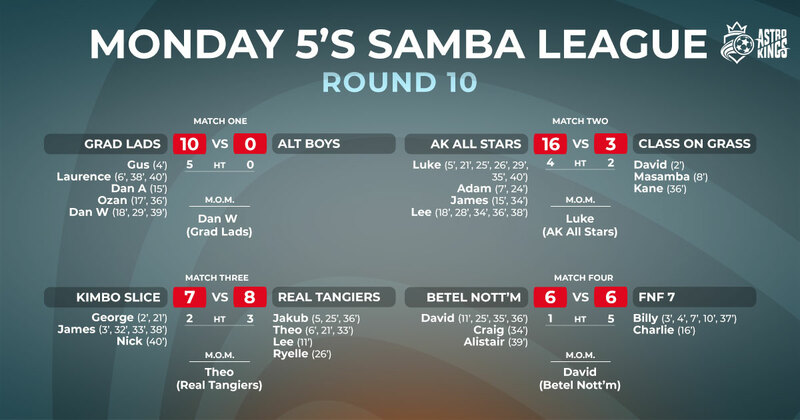 When Betel scored an own goal with the scores at six-four, it still could be anyone’s game. However Betel brushed-off the mistake and when Rafa scored his hat-trick goal a minute later, this inspired three more Betel goals. The game was then well and truly put to bed.